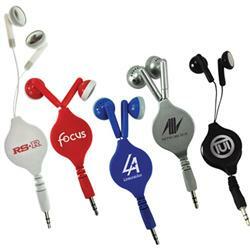 Audio Retractable Earbuds in a variety of colors custom imprinted with your logo! 36" retractable ear buds. Convenient for travel. Compatible with most audio devices. Individually polybagged. A great travel promotional item or tradeshow giveaway! Free Rush Available. Setup Charges: $50 Screen Charge. Available Imprint Options: Pad Print. Full Color Print Available - Please Inquire! 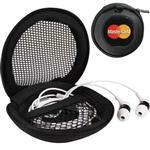 Earbuds, Retractable, 36 inch, Promotional Imprint. 13lbs per 200. Individually polybagged.